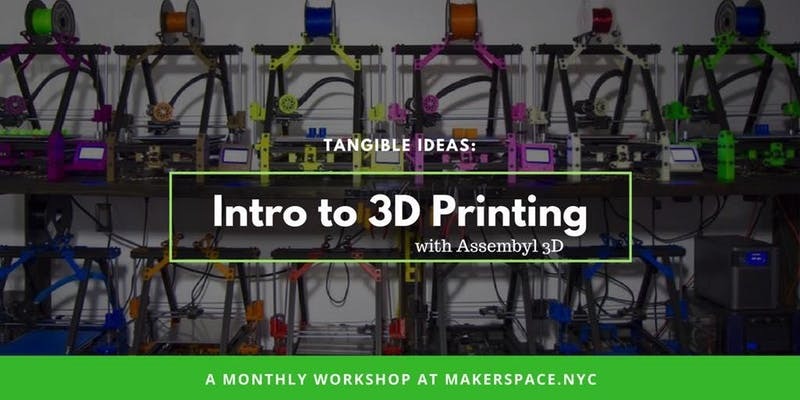 This 3-hour crash course will span a wide variety of topics and have you leaving with your own personally designed 3D print. All the main fundamentals of the 3D printing industry will be covered including current capabilities, material choice, applications and a general overview of what the technology can do for you. Experience this revolutionary technology first hand and learn how it will change the world. You will learn how different 3D models are created, either through 3D modeling, scanning or simply downloaded and what services you can utilize if you don’t have access to the technology. Absolutely, no prior experience needed! Sign up now and learn how 3D printing can benefit you! Take home your 3D print, a USB drive full of resources and 3x hours of 3D printing credit to kickstart your 3D printing journey. The Artist- Some artists are taking full advantage of this technology. From fashion designers to jewelry makers, 3D printing can help express your creative nature and bring it into a new medium. Creative agencies are also incorporating the technology into their marketing campaigns with anything from swag giveaways to unique trophies. The Educator- 3D printers are teaching machines with unparalleled power. If a picture says a thousand words, than holding a 3D printed object in your hand and examining it from all angles is worth a million. With the increased focus on STE(A)M in schools, 3d printing is being used as a tool to efficiently teach every subject in the most hands on way. The Entrepreneur- 3D printing is predicted to be a $21 Billion-dollar market by 2020. Impacting the medical, automotive, architecture, aerospace and consumer markets. Every entrepreneur knows the potential that this disruptive technology has regardless of their background. We will explore how current businesses are using this technology and go over various business models you can use yourself. The Hobbyist & The Professional- Eventually a 3D printer WILL be in every home.They will not all be plastic melting types but some sort of additive manufacturing device that will do something as simple as make you pancakes or complex as dispense your medicine. Get ahead of the curve and learn why 3D printing is such a big deal regardless of who you are. You will learn how to use a 3D modeling program called Tinkercad. Tinkercad is a free, online, cloud based application that has an extremely friendly and intuitive interface. Even with no prior 3D printing experience, the first thing you will do is design a 3D model and send it to the machines to be made while the class continues with the other topics. With the explosive growth in 3d printing, material choices are increasing nearly more than the printers themselves. Learn what makes each material different and which one to use for your intended application. 3D printing is revolutionary, but not magic. Learn the pros and cons of 3d printing and what type of 3d printing technology to choose. Did you know 3d printing was invented in the 80s? You will learn where it all started, where we are today and how this technology is speculated to change our future. Discover different ways small and large companies are taking advantage of 3d printing and how the everyday person can use it. Your own laptop computer (We have a limited number of loaners. First come, first serve). Your own lunch if you are super hungry. Your own personally designed, modeled and 3D printed object. 3x Hours of 3D printing credit from Assembyl 3D Printing (www.assembyl.com). A $45 value. Michael Perina is the founder of Assembyl 3D and a lifelong Staten Island resident. He built his first 3D printer in 2010 and launched his first company 3dfactory LLC shortly after, helping others build their first printer. 3dfactory LLC went on to sell over 500 DIY 3D printer kits around the world, with many of them going to schools and universities. In 2015, he formed Assembyl 3D offering local 3D printing services, 3D printed products and became Staten Island’s first local business to specialize in additive manufacturing. Assembyl 3D has since grown and is now a reseller for many OEMs while also offering consulting, training, STEAM infused curriculum and technical support. Michael has spoken at various tech expos regarding 3D printing and works with many schools and organizations here on the island helping them introduce and/or maintain this incredibly powerful technology.